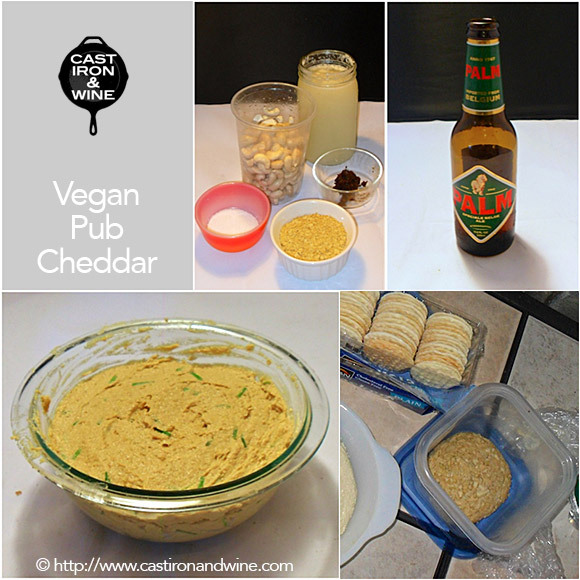 Mel here, hijacking the vegan cheese post a little this week. The cheddar was the vegan cheese experiment that I was looking forward to the most. I LOVE cheddar (like, psychotically) and wondered (i.e. doubted) if a quality one could be made without milk. I was very very surprised by its delightful tanginess and cheddar taste. So good! Making this one was another super long process, due to it requiring Rejuvelac like some of the others. And you get to use beer in the recipe! 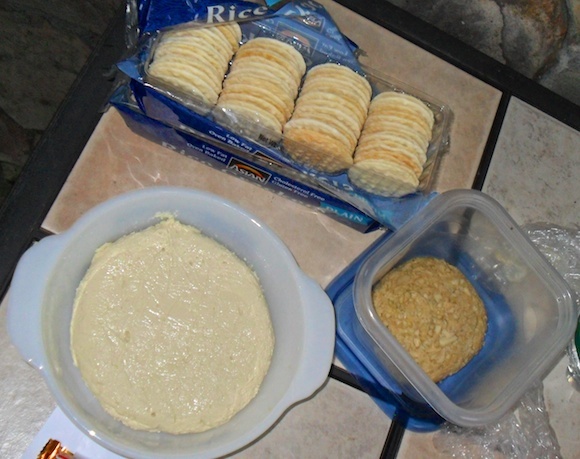 We ended up rolling a ball of it in blanched almond slivers (pictured above at right) and bringing it to my BFF’s cookout with some plain rice crackers, which really let it shine. It was really hard to not devour it ourselves. Seriously. And this is M. It’s a pretty well known fact that I am a beer snob. I spent a number of years working the beer business in my early 20’s, right as the craft beer movement was beginning to pick up steam in this country, and as such developed a love of brew. Beer is one of the oldest and longest of human traditions going back countless centuries. You will never find a bottle in my refrigerator with the word “Lite” on it. Nothing against those of you that want or like light beer but be forewarned that if you come to my home and you’re expecting something yellow and watery, you won’t be finding it in the kitchen. Anyhow, its because of my love of beer that this recipe had me wondering. The variation from one beer style to the next can be staggering, no two beers taste the same. So I was curious about how different beers would affect the taste and texture of this cheese. At this stage in the vegan cheese-making game I’m very pleased with how everything in Miyoko‘s book turned out, but this is an area that I finally have some expertise in. I had a couple of different options available to me: Palm Belgian Amber Ale, Rodenbach Red (a Flanders’ Red Ale), and a Dogfish Head 120 Minute IPA. The recipe itself calls for a dark ale. The Rodenbach is a sour ale and the IPA is a bit too high in alcohol(it can vary 15-20% ABV) so I went with the lightest of the bunch, the Palm. Palm is considered by many to be a middle road beer from Belgium, which means its an excellent beer but so is almost everything that originates from Belgium. So its a mediocre beer in its home country but that still makes it a rather fine beer to the rest of the world. Medium bodied, low carbonation, crisp, clean, and malty with some hints of lemon and yeast. The cheese came out thick but spreadable, tangy and a little dry. While sampling it I immediately thought of a cheese ball, so thats we made of it. The results were amazing and I already have plans to make more using different beer styles. Process the ingredients. Put the cashews, nutritional yeast, rejuvelac, 1 tablespoon of the miso, and the salt in a blender. Process until smooth and creamy, occasionally stopping to scrape down the blender jar and move the mixture toward the blades. Taste and add more miso if desired. Culture the cheese. Transfer to a clean glass bowl or container, cover, and let rest at room temperature for 24 to 48 hours, depending on how sharp a flavor you want and the ambient temperature (fermentation will proceed more quickly at warmer temperatures). At this point, the cheese can be refrigerated for up to 48 hours. Thicken the cheese. Pour the ale into a heavy medium saucepan and stir in the carrageenan with a wooden spoon. Bring to a simmer over medium-high heat. Stir in the cheese. Decrease the heat to medium-low and cook, stirring constantly, until smooth and glossy, 3 to 5 minutes. Remove from the heat and stir in the chives. Form the cheese. Pour into a glass or nonreactive metal mold and smooth the top. Let cool completely at room temperature. Cover and refrigerate for at least 24 hours. Dump slivered almonds into a bowl. Form cheese into a ball (this can get messy) and roll in almonds.